Hoda Badran - Who is Hoda Badran? Hoda Badran is the Chairperson of the Alliance for Arab Women (AAW), a voluntary organization headquartered in Cairo. AAW works with a network of over 350 NGOs on issues of Arab women's human rights, legal literacy for women leaders, implementation of the Beijing Platform of Action, women's political participation, and supporting education for impoverished children. AAW provides training workshops, conducts research, and prepares reports on women's rights. Ms. Badran is Representative of NGOs for the meeting of the Summit of Arab Women El Manama, El Bahrain, and a member of the National Council for Women (Egypt). She served as First President for the Center of Human Rights, United Nations, member of the Committee on the Rights of the Child (CRC) from 1991-1995, and served as Egypt's representative to the UNICEF International Board. Ms. Badran was also Professor of Social Research and Community Participation at the University of Helwan in Cairo, Egypt. 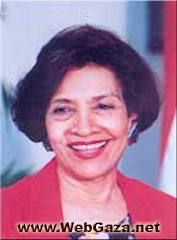 Hoda Badran was awarded the UNESCO Award for distinguished women in 1995, the Emirates Women Union Award for Leadership in Women's Activities in 1994, and the Distinguished UN Representative Award from the government of Sri Lanka in 1982.